As widely expected, on Wednesday, the Fed raised interest rates for the third time in 2017. However, this move to raise the funds rate by 25 basis points is set to send ripples across the economy. And it’s those with credit card debt who’ll be hit the hardest. The following graph shows how much real-world interest rates have changed over the last 2 years. 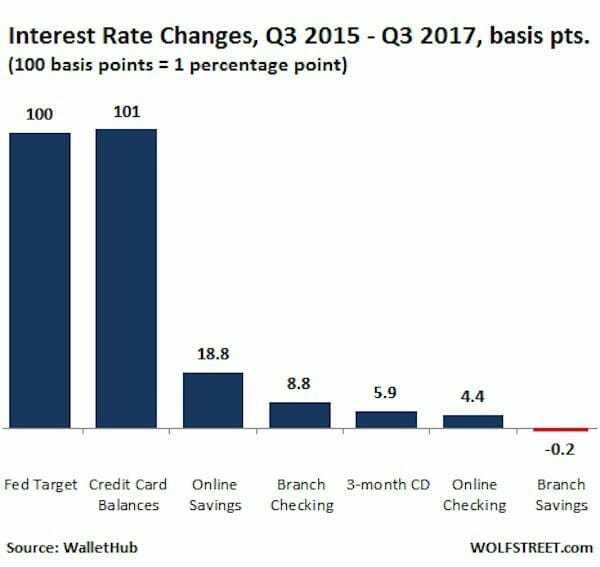 While most interest rates have barely moved, the interest rates charged by credit cards have seen significant increases. This is now the fifth interest-rate hike since the Fed began their rate-hike cycle in December of 2015. According to an analysis carried out by WalletHub, the last four hikes already hit consumers with an additional $6 billion in interest on credit card balances in 2017 alone. The Fed’s widely expected quarter-percentage-point hike on December 13 will cost consumers with credit card balances an additional $1.5 billion in 2018. This would bring the incremental costs of five rates hikes so far to $7.5 billion next year. The cumulative effect on existing borrowers is mounting. Consumers’ outstanding “revolving credit” to bank-issued and private-label credit cards reached $977 billion in the third quarter and is expected to grow to a trillion by the new year. Consumer credit bureau TransUnion’s Q3 2017 Industry Insights Report found 195.9 million consumers had a revolving credit balance of a total of $1.35 trillion. This means they each owe roughly $6,892. And with the average interest rate at 20%, they’d be paying $115 a month in credit card interest payments alone. If you are carrying any sort of balance, you will immediately feel the effects of [a quarter-point rate hike] and pay more interest. For now, the Fed has penciled in, and economists expect, three hikes next year. These hikes are all part of the Fed’s goal of stabilizing the economy with a “neutral” rate at somewhere around 2.5% to 2.75%. And it’s for this reason economists expect three hikes next year. However, this would have a knock-on effect on interest rates, which increase in tandem with rate hikes. This means borrowers can expect to be burdened with about an extra $8 billion annually, adding further strain to the $7.5 billion from the prior rate hikes. Too Much for Consumers to Bear? Consumers with high-interest credit-card balances who are already struggling to pay off their debts are in danger of seeing their debt grow even more. Credit card delinquencies have started to tick up, from 2.16% in Q1 2016 to 2.53% in Q3. While still soothingly low overall, the damage is always concentrated in the subprime segment – and on lenders that specialize in subprime lending. And there, delinquency rates are jumping. Yet these are still the best of times, with the lowest unemployment rate since the year 2000. 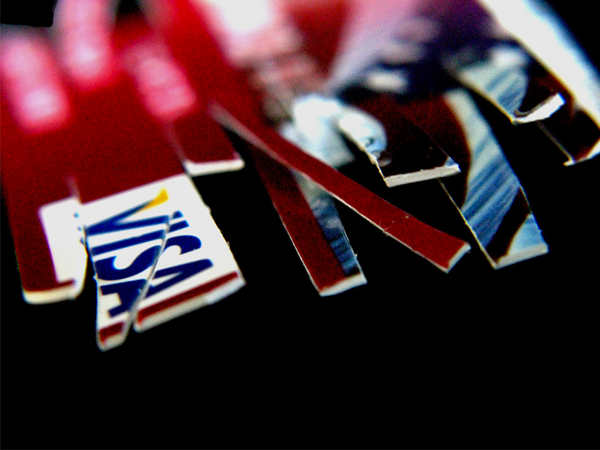 This means both credit card companies and consumers will be facing mounting financial challenges in the months ahead. It’s a vicious cycle. As consumers get behind, they reduce their spending. And when they default, credit card companies lose money and the economy suffers. So as interest rates continue to rise, the number of consumers who fall into default will continue to increase. This process could be what ultimately tips the economy into recession. With another recession possibly around the corner, it would be wise to protect your wealth in something that has been proven time and time again as a source of financial security such as physical gold.